My latest WideAngle assignment took me to the ancient Silk Road town of Kashgar, on China’s remote western front. I was on a mission to shoot, of all things, lamb kebabs, and to capture Uyghur street culture surrounding the preparation and consumption of this grilled speciality. The people were friendly and responded naturally to the presence of my camera. 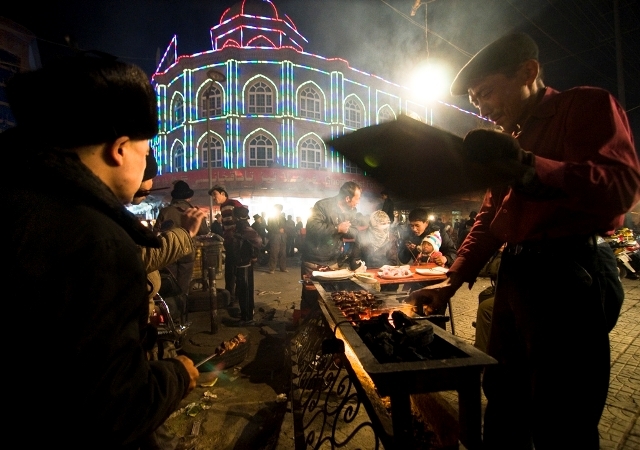 This resulted in the creation of photographs that seem to transport the viewer into the context of Uyghur street-life. To make this experience complete, I used the smoke and lights to capture the unforgettable scent of lamb fat mixed with cumin and chili as it hit the charcoal embers. As a photographer, uploading captures and sending images out from China can be tricky and frustrating, especially in off-the-beaten-track locales or political sensitive areas. Although Internet is often available, it is slow and cumbersome in far-away locations. In some cases, the Tibetan regions of Gansu, for example, foreigners are banned from using it. The Internet was shut down in Kashgar and Xinjiang for a year and a half, due to political tensions. While on a shoot in November, transferring files to websites, email uploads and the ftp were not working properly. Long hours on the net and a heavy dose of patience was needed to accomplish the job. In short, the ever-present hard-drive for a secure backup is a necessity when working in this part of the world. Boaz Rottem is an American/Israeli photographer who spent several years based in Nanjing, China, but now works out of Hong Kong. He’s a member of The WideAngle network of photographers; for more of his images, please click here. There’s a lot more to assignment photography in remote locations than many people realise. Boaz Rottem (WideAngle’s man in Nanjing for several years but now based in Hong Kong) is experienced enough to have come across many of the pitfalls. Great to have this insight from him here. Thanks Boaz.